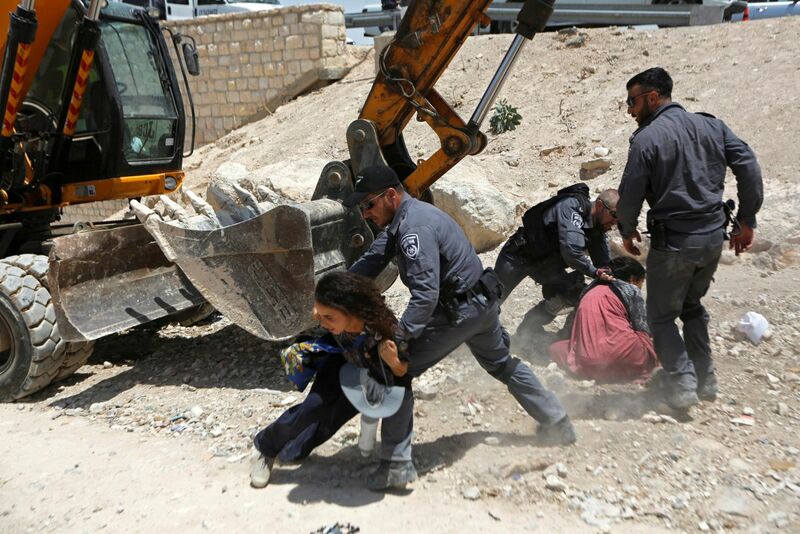 European countries are joining forces to prevent the demolition of the Bedouin community at Khan al-Ahmar in the West Bank, said British Minister of State for the Middle East Alistair Burt on Wednesday in Parliament. France and Ireland have both has since echoed Britain's resignations in a similar statement from their foreign ministries. More European countries are expected to voice their concerns. The UN also expressed its dismay over recent Israeli actions. The office of Nikolay Mladenov, the UN Special Coordinator for the Middle East Peace Process, tweeted that the envoy "condemns the demolitions at Abu Nuwar and preparations to demolish Khan Al Ahmar." "Israel should stop such actions and plans for relocating Bedouin communities in the occupied West Bank," the tweet read. "Such actions are contrary to international law and undermine the two-state solution." The European Union joined the criticism early on Thursday, saying in a statement that the demolitions "together with plans for new settlement construction for Israelis in the same area, exacerbate threats to the viability of the two-state solution and further undermine prospects for a lasting peace." The statement further said that the EU "expects the Israeli authorities to reverse these decisions and fully meet its obligations as an occupying power under International Humanitarian Law." Britain noted that it reiterated its concerns to the Israeli government over the planned demolitions, a fact that Alistair Burt mentioned in response to a parliamentary question from Labour MP Richard Burden. He revealed that the British ambassador had protested the matter on Monday to Israeli National Security Adviser Meir Ben Shabbat. “This should not be happening and need not be happening,” added Burt. Other members of Parliament joined in the discussion. While some spoke as friends of Israel who were worried about the lack of progress in the peace process with the Palestinians, others called for Britain to immediately and unilaterally recognize a Palestinian state in response to the evacuation of Khan al-Ahmar, and what they called Prime Minister Benjamin Netanyahu’s refusal to abide by international law. A similar statement released by French Foreign Ministry spokeswoman Agnès Von Der Mühll chided the action as going against international humanitarian law, and said the demolition makes the already precarious living conditions of the villages' residents more difficult. "The villages are also located in an area which is essential for the continuity of a future Palestinian state and thus the viability of the two-state solution, which has been undermined today by the Israeli authorities’ decisions," the statement said. France urged the Israeli authorities to "refrain from any measures aimed at extending [Israeli] settlements in the Occupied Territories or making them permanent, in contravention of international law, as United Nations Security Council Resolution 2334 reaffirms. France, in conjunction with its European partners, will continue to keep a close eye on the issue." Ireland has also joined the condemnation of Israel's plan to demolish the village, with Irish Minister for Foreign Affairs Simon Coveney saying on Wednesday night that he was "extremely worried about the imminent threat to the Bedouin community of Khan al Ahmar." "The eviction of families and demolition of their homes is an action which has a strong historical resonance in Ireland, and which brings discredit on Israel," Coveney added. Coveney said that "Ireland has made these points clearly to Israeli representatives... I have also made Ireland's views on settlements known directly to the Prime Minister of Israel." He added that in light of his previous statements, he found it "deeply disappointing that Israel is nonetheless proceeding with this reprehensible action." In Israel, Joint List chairman, MK Ayman Odeh, called the planned demolition a "war crime which will leave entire families without a roof over their heads. People already evicted twice by the state, struggling now for their home and their school which gives them hope." This is not only a human injustice, Odeh said, but a political maneuver by the government to sever and dismantle the Arab settlements in C areas, and to expand the Israeli settlement blocs, "thus preventing any chance for a Palestinian state and peace." Eleven people were arrested after throwing stones Wednesday inKhan al-Ahmar. Dozens of Palestinian were wounded, according to the Red Crescent. Four were taken to the hospital, and three police officers were lightly wounded, one of whom received medical care on the scene. Representatives of Israel's Civil Administration hung notices around Khan al-Ahmar in the West Bank on Tuesday evening, warning the village's inhabitants of their impending expulsion. By Wednesday morning there were bulldozers on the scene and clashes broke out. The expulsion of several dozen Bedouin families from Khan al-Ahmar is seen as enabling future expansion of the settlement of Kfar Adumim. The notes announcing the imminent eviction do not provide a certain timeline for intervention by authorities, though sources in the defense establishment told Haaretz that it could happen in weeks, or even days. Meanwhile, the area around Khan al-Ahmar has been closed to the general public until the end of July. The Civil administration is planning to build a road to the place for the purposes of the eviction. The works are supposed to start within days and the eviction can't begin until the road is ready. The residents are supposed to be moved to Al Jabel, a village near the Abu Dis garbage dump that the state allocated for the permanent settlement of the villagers. Earlier this week, Civil Administration officers, accompanied by police officers, took measurements in Khan al-Ahmar and reportedly counted the flocks of sheep as part of a close inspection. The village houses several dozen families from the Bedouin clan of Jahalin, who moved there after their expulsion from the Negev in the 1950s. They then built their homes in Khan al-Ahmar on state-owned land. Though in theory their homes could be legalized retroactively, the state declined to go down that route and offered them alternative housing in the nearby village of Al Jabel. On May 24, following a lengthy legal campaign, Supreme Court Justices Noam Sohlberg, Anat Baron and Yael Willner allowed the state to demolish the village’s homes.